Not your usual ravioli, but I promise you it works and it tastes absolutely amazing. The sweetness of the pumpkin and the crème angliaise with the fragrant spices just goes together so beautifully. I wonder if dessert pasta will be popular in the future because I actually really enjoyed these ravioli. And I actually have some ideas in mind to continue this dessert ravioli journey and possibly improve it, but let’s leave that for another day. Is pasta more of a savoury food? I am starting to convince myself that it really just depends on what you put with it. Maybe some things work better than others when it comes to dessert pasta. 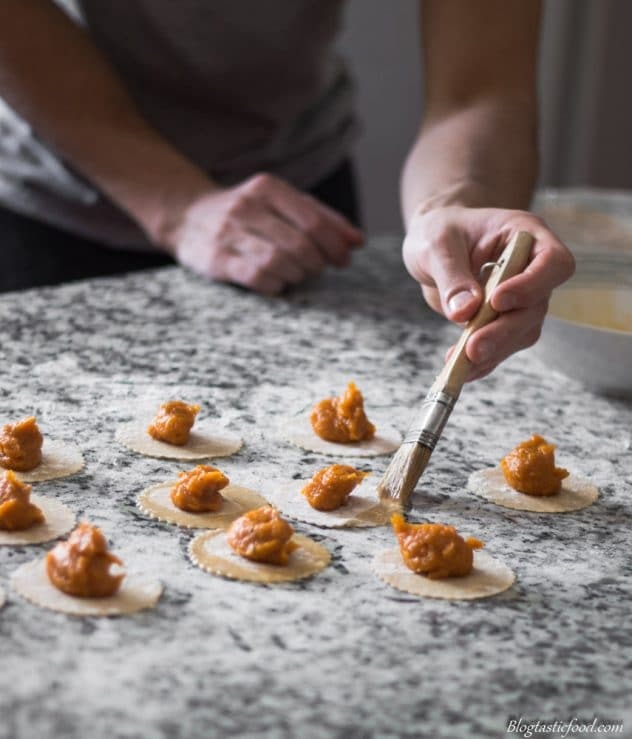 I mean, pumpkin ravioli is a classic and I have basically just done that in dessert form. 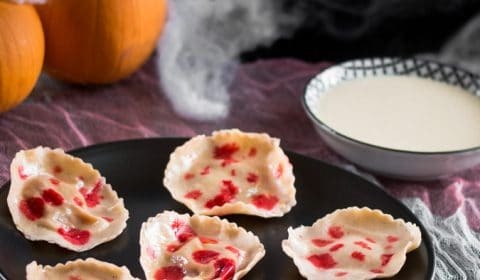 Perhaps we can come up with our own classic dessert ravioli recipe and create history right here on this blog!! That would be so cool. Since filming and taking photos takes time, this is actually something that I did. I made the pasta dough, the filling and the sauce one day. And then I rolled the dough and constructed the ravioli the next day, and this made my life a whole lot easier. So sometimes it’s better to break a more time-consuming recipe like this into manageable pieces. 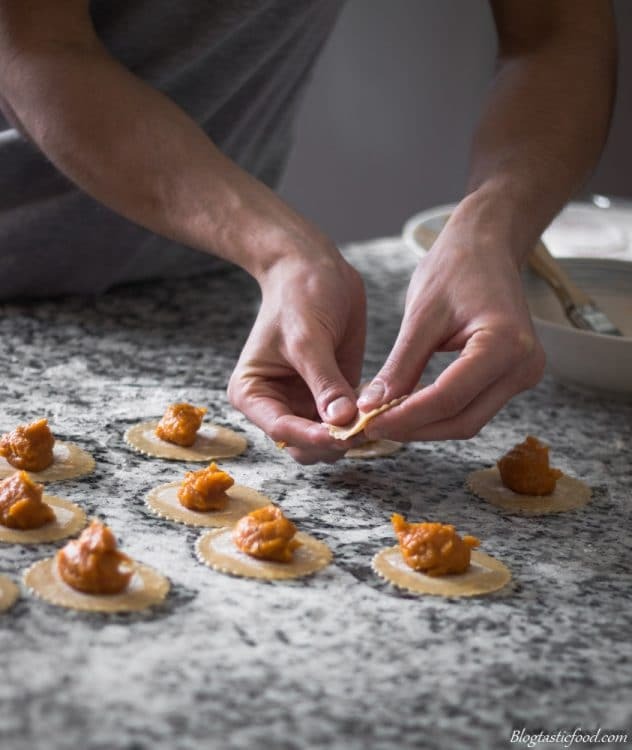 Another great suggestion would be to construct the ravioli and get everything prepared. Then, when it’s time to serve, that’s when you boil and plate them so that you can serve the ravioli as fresh as possible. 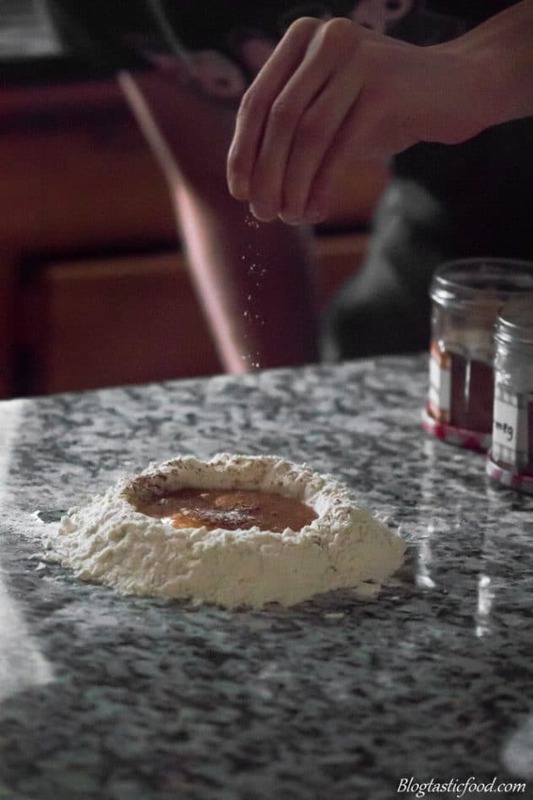 There are so many different recipes and measurements for making fresh pasta dough, but I don’t think I know a formula that is simpler than this. It’s impossible to forget 100g of flour per egg because it’s so straightforward. And it really does work. The only time I can see myself not using this measurement is if I want the dough to be more en-richened by adding extra egg yolks or and reducing the number of whites. However, I have never really felt the need to do that. So if you want my advice on making fresh pasta dough, stick with the 1 egg to 100g of flour method, and you won’t need to keep searching for a new recipe. Now, of course, all eggs have slightly different weights and doughs can behave a little differently at certain times. And in that situation, you would add a touch more flour or a splash of water depending on whether the dough needs more or less moisture. 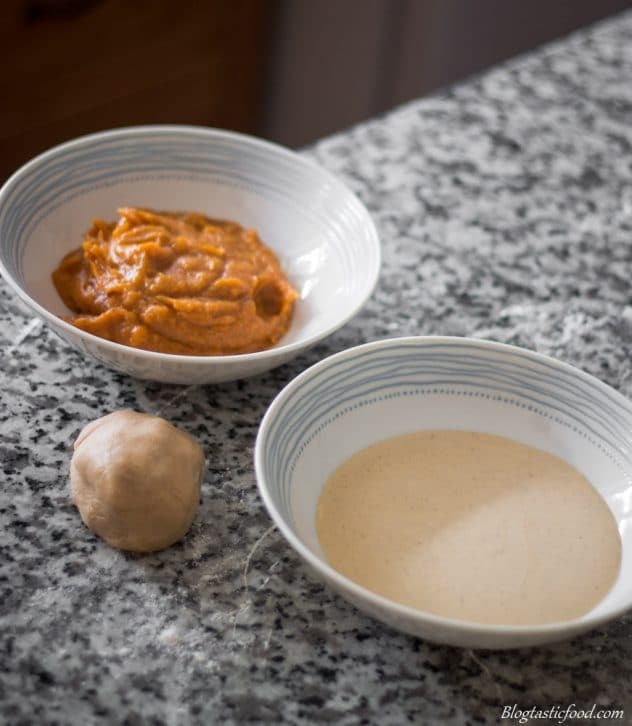 Although I would advise being careful with this, because sometimes the dough may appear to be too dry and rough at first, but when you keep kneading it you realise that simply isn’t the case. So knead the dough well before deciding whether it’s too dry or moist. What makes a good pasta dough? 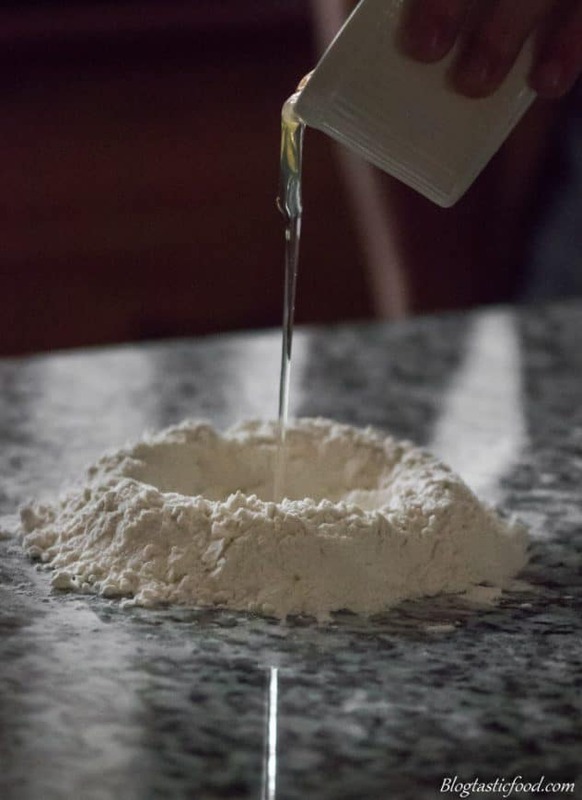 You always read or hear people say to knead the dough until it is smooth and pliable, but what does that mean when it comes to making pasta dough? Well, the smooth part is fairly straightforward. A dough that has a smooth texture and no lumpy rough bits. However, the texture should be slightly elastic. Keep in mind that I said slightly, so I don’t mean that you should be able to fling the dough like a lucky band. However, when you give the dough a little pull and let go, it should gently spring back. So don’t rush the kneading process. 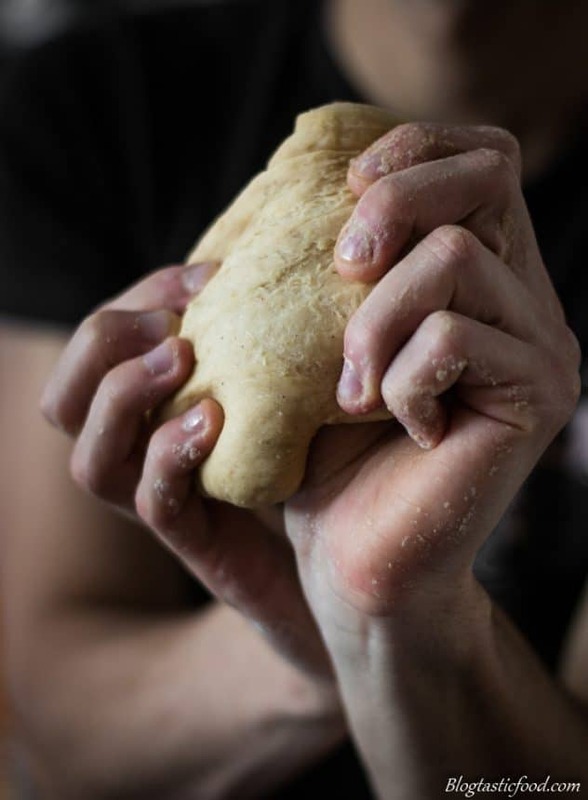 Keep kneading the dough until you get that smooth and pliable effect. As always, thank you so much for reading my post, you are so awesome. And I hope you have the most amazing Halloween. If you want to follow me on social media, I am on Facebook, Instagram, Pinterest and Twitter. And please let me know your thoughts in the comments section down below because I am curious to know what you think of dessert Ravioli. 400 g of peeled seeded butternut squash, seeded cut into inch thick dices. Put your butternut squash in a bowl along with your vegetable oil, a pinch of nutmeg, a pinch of cinnamon and a pinch of salt (no pepper). Mix together until the squash is coated in the oil and seasonings. Put the squash on a tray lined with baking paper, make sure the squash in all nice and spread out, then roast in the oven for 30 minutes. Pour the flour onto a flat, clean surface and then use your hands to make a well. Crack your eggs into that well. Also add a pinch of nutmeg, a pinch of cinnamon and a pinch of salt. Then slowly incorporate the flour into the egg as you mix it through. Once the egg and the flour come together in a rough mess, Firmly press everything together, then start kneading the dough. Knead the dough for about 5-10 minutes until smooth pliable. 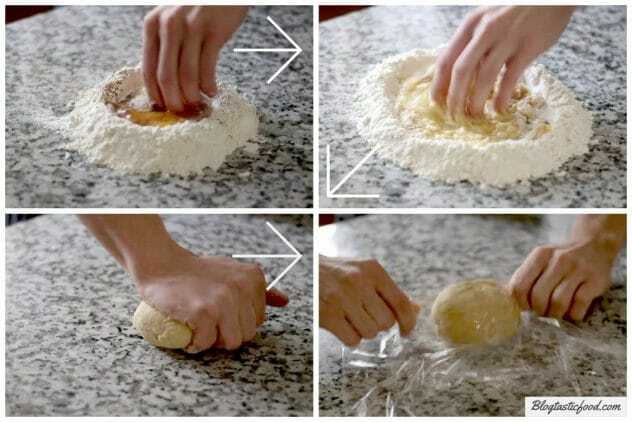 Cut the dough in half, wrap both halves in cling wrap and then rest in the fridge for 20 minutes. Once your pumpkin is cooked, transfer it into a food processor with your icing sugar and cream, then blitz for a minute or 2 until you have a nice smooth puree. Transfer the pumpkin filling to a bowl or container, cover with cling film and then put in your fridge. Set up a pasta machine, with plenty of flour for dusting. Get both halves of your pasta dough out of the fridge. Unwrap the dough, dust with flour, then dust the rollers in the machine. Roll the dough through the thickest setting of the pasta machine a couple of times, then dust the dough and the rollers again. Roll the dough through the second thickest setting a couple of times. Repeat this cycle until your pasta dough is thin but not too thin. So my pasta roller's thickest setting is 1 and the thinnest is 9. I stopped rolling my dough at about 5-6. Make sure you keep dusting with flour so nothing sticks and when the dough gets too long to handle, cut it in half. Once you have finished rolling the first half of your dough. Lay it out flat on a clean surface, then cover it with a piece of cling film or clean tea towels so it doesn't try out. Then roll the second half of your dough. 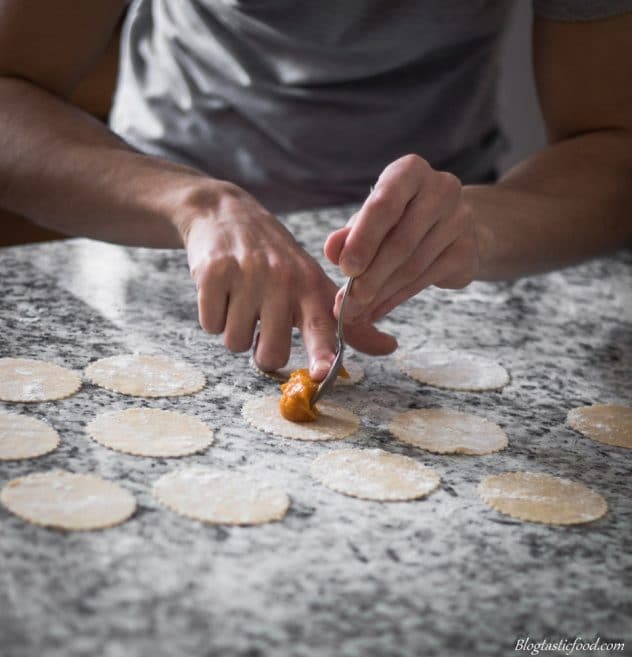 Use a pastry cutter (I used a circle pastry cutter that had a 6-7cm diameter) to cut circles out of your pasta (leaving as little space between each cut as possible). Spoon about 1 teaspoon of pumpkin spice mix onto half of your pasta disks. Use a pastry brush to brush the egg wash on the edges of your pasta. Then lay the other pasta disks over the top. Pinch the edges so that pumpkin mixture is firmly sealed in. 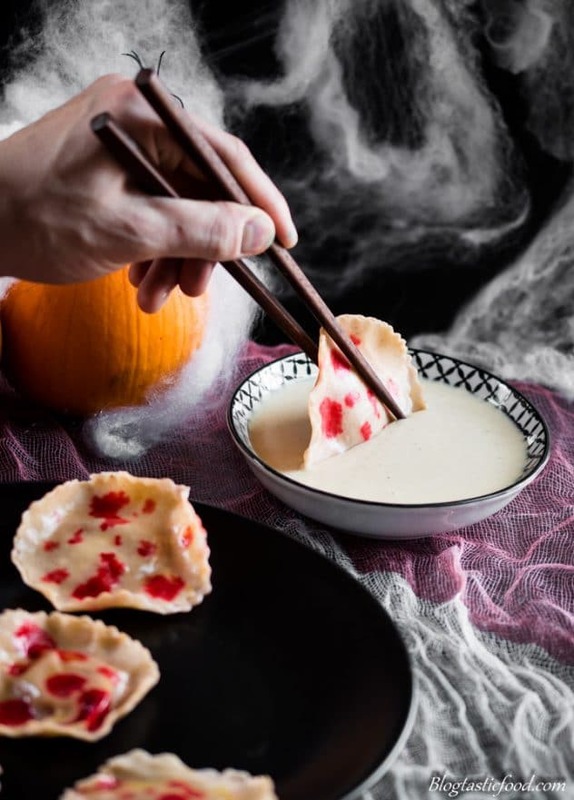 Use your clean paintbrush to lightly dab the red food colouring on the ravioli to get a blood effect. 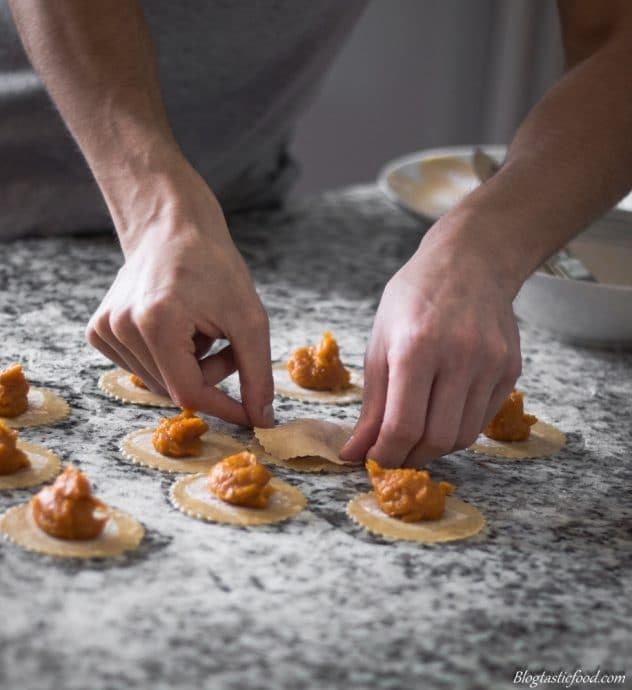 Set your ravioli aside and again, cover it to prevent it from frying out. Bring a pot of salted water to a boil, then add your ravioli. Boil the ravioli for about 2 minutes and then use a slotted spoon to take them out. Whisk your sugar and egg yolks in a large bowl until you achieve a pale colour. Put your milk, vanilla, cardamom pods, star anise, nutmeg and cinnamon in a pot. Put the pot over high heat and scald the milk (meaning turn the heat off as soon as it starts to boil). Let the spices infuse in the milk for about 1-2 minutes. Whisk the egg yolk mixture while SLOWLY pouring in the hot infused milk. Once all of the milk is incorporated, put the custard mixture back into the pot. Heat the crème anglaise over low heat while continuously stirring it. After about 5-10 minutes, the crème anglaise should be thick enough to coat the back of the spoon. Use a sieve to strain the crème anglaise in a bowl, and your sauce is ready for your ravioli to dip into. This dessert is served best warm so you can use a slotted spoon to plunge the ravioli back into hot water for 10 seconds before serving. You can also heat up your creme anglaise in a bowl over a water bath VERY lightly so it's just warm. If you feel like this recipe will take too long to prepare in one day, make the dough, the filling and the sauce in advance. Then construct and cook the ravioli later on. Remember the 1 egg to 100g of flour measurement. It's a solid measurement for making pasta dough and you can't forget it because it's so straightforward. Knead the dough until smooth, but also until it has a slight elasticity to it. What a fantastic recipe! 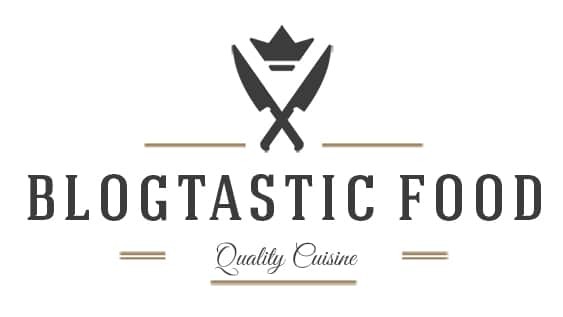 and gorgeous blog – so happy to follow and get more of your wonderful recipes. So Ghoulish! 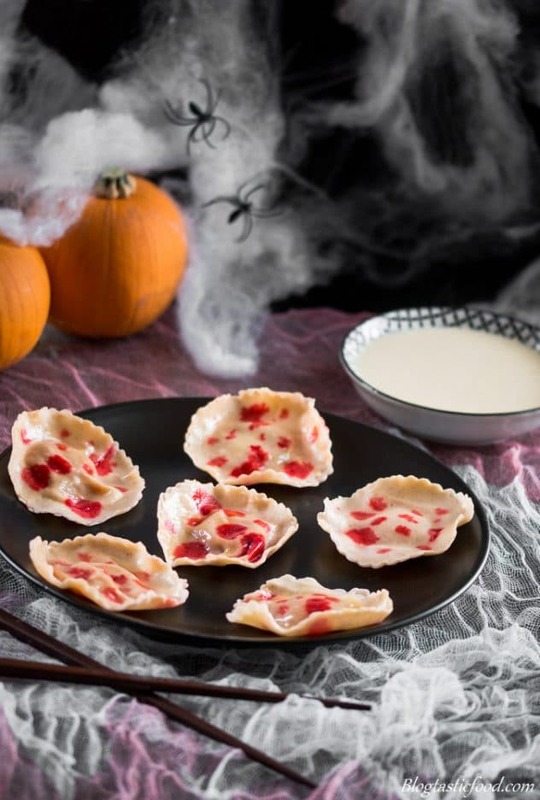 A Halloween Treat for sure! Wow these are beautiful. What an imagination you have. wow. Desserts don’t typically grab my attention. They’re all pretty, but I prefer savory. But this is outstanding! And spiced creme anglaise? brilliant. 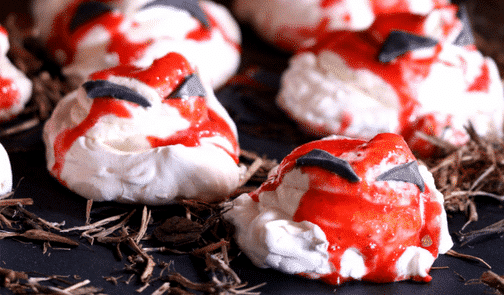 Such a creative and imaginative recipe. They look fantastic, great photography too. These look beautiful and tasty too! Your photos are so good! I love autumn, you have some great recipes for the season!